"The Ukrainian authorities should immediately clarify what, if any, evidence they have to substantiate the extremely serious criminal accusations they have launched against Vyshinsky," Denber said. "Criminalizing expression that represents views the authorities disapprove of is out of line with Ukraine’s human rights obligations." 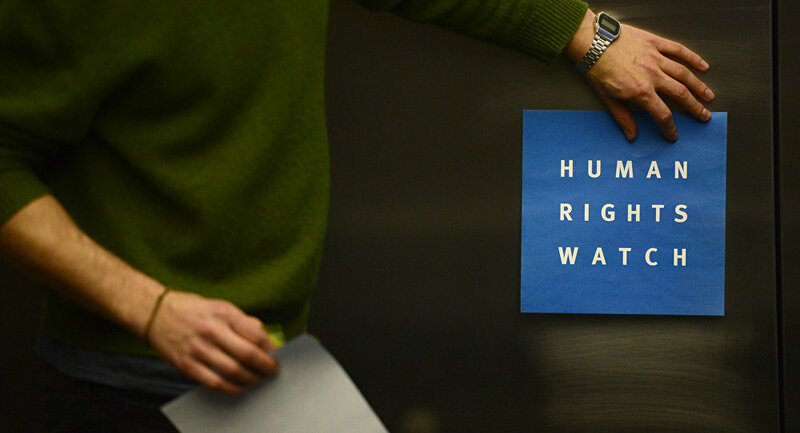 Human Rights Watch (HRW) supports the assessment of the Organization for Security and Co-operation in Europe (OSCE) that Ukraine’s actions against RIA Novosti and efforts to curb so-called "propaganda" should not interfere in work of journalists, Denber said. "We fully support the OSCE’s representative on media freedom’s assessment that the fight against propaganda must not fall short of international standards, and that it should not lead to disproportionate interference in the work of journalists and media outlets," the deputy director said. Vyshinsky was detained on charges of treason on Tuesday. The same day, the Ukrainian Security Service (SBU) broke into the office of RIA Novosti Ukraine in Kiev and the homes of two other journalists. Earlier on Wednesday, Vyshinsky's lawyer said that the authorities began the prison transfer of the journalist from Kiev to Kherson, where they will determine a measure of restraint for him. Russia's International News Agency Rossiya Segodnya has launched a Twitter hashtag #TruthNotTreason in support of RIA Novosti Ukraine news portal head Kirill Vyshinsky, arrested in Ukraine.